Deals: get 25% off Skoda Fabias now | What Car? 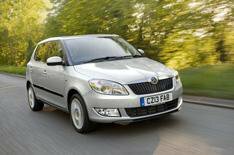 Skoda Fabia hatchback and estate prices are being discounted by 25%. For example, a Fabia hatchback costing 12,140 will cost 8995 after the 25% discount has been applied; that's a saving of 3145. The discount is specific to one trim level in the Fabia range: the 1.2-litre 12V 69PS SE. If you are after an estate, the price drops from 13,960 to 9995. We reckon the Skoda Fabia is a spacious supermini that rides well, even if its not the most exciting car inside. The SE trim that features in this discount includes: 15-inch alloy wheels, air-conditioning, tinted glass, electric door mirrors, remote central locking and additional rear speakers. The discounted Fabia also gets metallic paint and a spare wheel, normally two optional extras, included. Skoda has also confirmed that the 25% discount will run in conjunction with Skodas current no VAT offer, saving potential buyers even more. If customers buy through Skoda finance, they will receive free servicing for up to three years or 30,000 miles.